After nine years of near flawless operation, the Hubble-class Compton Gamma Ray Observatory, one of the most successful space telescopes ever launched, is being readied for a kamikaze plunge into the atmosphere on Sunday, June 4. One of the telescope's three stabilizing gyroscopes failed in December and NASA mangers, worried that additional failures could leave the $617 million craft uncontrollable, decided in March to bring it down now, while they still have enough control to ensure a harmless breakup over the Pacific Ocean. In an uncontrolled re-entry, NASA managers say, there is a 1-in-1,000 chance that someone under GRO's orbital path - and that means anyone living 28.5 degrees to either side of the equator - could be killed by falling debris. "It's not a pleasant day when you have to make a decision to stop doing world-class research," said Edward Weiler, NASA's associate administrator for space science. "But the bottom line is there can be no tradeoff between lost science and even the slightest increased chance of loss of human life." Astronomers around the world "will be quite disappointed with this decision and I'm personally, profoundly disappointed," said GRO project scientist Neil Gehrels of NASA's Goddard Space Flight Center in Greenbelt, Maryland. "But I do respect the importance of safety and instead of looking at this as a loss, I think we'll celebrate the great scientific success the mission has had over the last nine years." Not everyone was so charitable. James Ryan, a physics professor at the University of New Hampshire and a Compton investigator, said NASA is ignoring the potential threat of a major solar flare during the critical final stages of the satellite's descent. There have been four major flares so far this year, he said, and there is a 1-in-1,000 chance of another major flare on any given day. Such a flare could cause Earth's upper atmosphere to swell slightly, enough to make the satellite's orbit rapidly deteriorate. If the effects of such a flare were felt by the satellite at the worst possible time - after GRO's orbit had been lowered by three of four planned deorbit rocket firings - flight controllers might not have enough time to take corrective action. And that, Ryan said, could lead to the very uncontrolled descent NASA fears. "I would just keep that baby safely in orbit, let it do its thing - don't muck with it - and ... study this issue in more detail," Ryan told Astronomy Now in a May 9 interview. A NASA spokeswoman in Washington dismissed Ryan's concerns as "just the opinion of one man. The decision has been made." Launched from the shuttle Atlantis on April 5, 1991, GRO has discovered 70 gamma ray quasars, 10 rare gamma ray pulsars and more than 2,500 gamma ray bursts, the most titanic explosions since the big bang. More than 1,000 scientific papers have been written based on data from the space observatory. Alan Bunner, a senior science manager at NASA headquarters in Washington, described Compton as "a workhorse ... far exceeding our expectations for a two- to five-year mission. New discoveries made by Compton changed our view of the Universe in fundamental ways." But GRO has suffered several equipment malfunctions in recent years, the most recent being the failure last December of gyroscope No. 3. 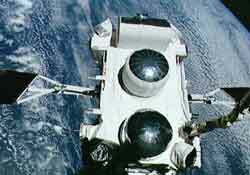 At that point, NASA managers began studying a variety of scenarios to determine whether GRO could be safely operated with just two gyroscopes or whether it made more sense to go ahead and bring it down. Not enough fuel is left on board to boost the satellite to a higher orbit and a shuttle repair or retrieval mission was ruled out early on because of safety issues and scheduling problems. If NASA did nothing, the Gamma Ray Observatory would fall back to Earth on its own in three to 11 years, depending on the effects of solar activity on the upper atmosphere. But the issue is complicated by an engineering analysis that indicates there is a 10 percent chance GRO will suffer a second gyro failure in the next three years. 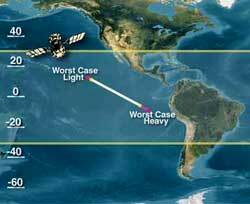 While the satellite can be spun up for stability and brought down in a controlled fashion with no gyros - the so-called "zero gyro mode" - there is a 1-in-4 million chance someone could be killed by debris. With two operational gyros, the odds are an even more remote 1-in-29 million. 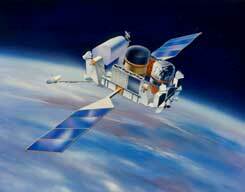 At 33,000 pounds (15,000 kg), the Gamma Ray Observatory is one of the heaviest satellites ever launched by NASA. During re-entry, whether controlled or not, 30 to 40 pieces of debris weighing 40 pounds (18 kg) or more will strike Earth's surface at velocities of 200 miles per hour (322 kilometers per hour). "GRO's one of the heaviest spacecraft ever launched by NASA," Weiler said. "Through in-depth analysis, we know many chunks would make it to the ground, some pieces as small as titanium bolts, some pieces as large as a ton, travelling 200 miles per hour. And this would be over a very large debris field. "There is a 10 percent chance we could lose (a second) gyro over the next three years," he said. "If GRO re-enters on its own, without control, there is a 1-in-1,000 chance of a human fatality. That would be in a case where we didn't do anything and we let it come down by itself." To an astronomer, Weiler said, 1-in-1,000 "sounds like pretty slim odds. But to many Americans who spend their dollars on lottery tickets ... 1-in-1,000 is a real chance when you're dealing with human life. And that 1-in-1,000 gets worse every day that passes after June 3." And so on June 4, despite Ryan's objections, NASA flight controllers plan to order the Compton Gamma Ray Observatory to plunge back into the atmosphere high above the Pacific Ocean, ending a storied astronomical career. Convince the experts, policy makers and public that NASA knows what it is doing all along the way. GRO's descent is scheduled to begin on Tuesday, May 30 at 9:54 p.m. EDT (0154 GMT Wednesday) with the first of four carefully planned rocket firings designed to lower the perigee, or low point, of GRO's orbit in incremental steps. That way, if any additional problems develop flight controllers will have time to attempt corrective action. Until the time of the final "burn," that is. It is during this period toward the end of the descent that, Ryan argues, a major flare could cause GRO's orbit to deteriorate faster than NASA could mount a successful response. 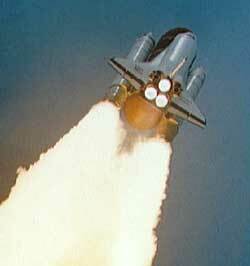 The first rocket firing is designed to put the craft in a 318-by-221-mile (512-by-356-kilometer) orbit. 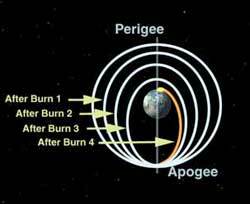 The second burn on Wednesday, May 31 at 10:41 p.m. (0241 GMT Thursday) will lower the perigee to 157 miles (253 kilometers). On Sunday, June 4 at 1:37 a.m. EDT (0537 GMT), perigee will be lowered to 93 miles (150 kilometers) and on the next orbit, a fourth rocket firing at 3:05 a.m. EDT (0705 GMT) will drive the craft to the desired re-entry point. 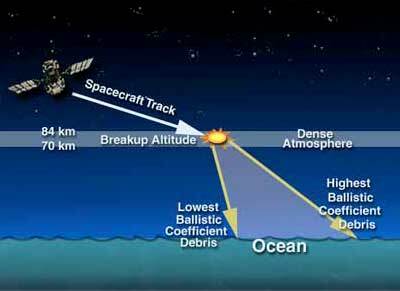 Breakup should occur at an altitude between 44 miles (70 kilometers) and 52 miles (84 kilometers). Impact is expected to occur approximately one hour after the fourth burn starts. If all goes as planned, GRO's debris footprint, that is, the zone in which wreckage could hit the surface, will measure 16 miles (26 kilometers) wide and 2,550 miles (4,104 kilometers) long. The footprint will stretch along GRO's flight path on a northwest-to-southeast track crossing the equator west of South America. The nearest land is more than 650 miles (1,046 kilometers) away. Re-entry and breakup are expected to take place during darkness, but it will be too far away from land for anyone to see any flaming debris. Preston Burch, deputy program manager for Space Science Operations at NASA's Goddard Space Flight Center, said the space agency would work with aviation and maritime authorities "to ensure the impact area is free from traffic during reentry." William Harwood has covered the U.S. space program for more than 15 years. He is a consultant for CBS News and writes The Washington Post and Space News. He maintains a space website for CBS News. Animation shows how the Compton Gamma Ray Observatory is believed to have broke apart during its reentry into the Earth's atmosphere.